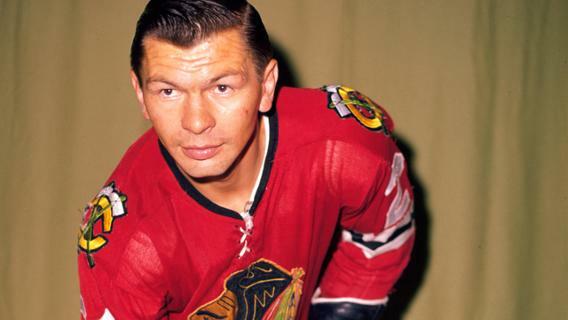 I was saddened by the passing of hockey legend, Stan Mikita, this past week. I was first introduced to him as a child watching hockey on TV with my dad. Those were special times with dad – sitting on his lap or next to him on the couch as he explained the game of hockey to me. He introduced me to the players via the TV. He was especially proud of Stan Mikita, a fellow Czech (well actually a Slovak) so I guess a fellow Czechoslovak would be more accurate. Memories of the many times spent watching the Blackhawks with my dad are some of the most special father/daughter memories I have. Because money was tight, dad didn’t go to many games at the Chicago Stadium, however he did take me once. It was awesome! 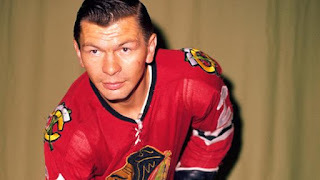 Our next door neighbors were friends with Stan Mikita’s in-laws and sometimes they would have barbeques in the summer and the Mikita family would be there. I remember that once even Bobby Hull was there. In those days, it was impolite to gawk at celebrities and I had strict instructions not to bother them during those barbeques. However, being the teenager I was at the time, I asked for Stan’s autograph. He was very gracious about it. I remember when his son Scott was a toddler and they told me to ask him who his daddy was so I did. It was soooo cute as he answered “Staaanley”. And when I asked him, "Stanley who? ", he answered “Mikiiita”. His wife, Jill, gave me one of Stan’s old blue plaid shirts (I still have it somewhere). It had been mended but I wore it a lot for several years. I’m not sure how it came about, but when Stan’s sister, Vera, was visiting from Czechoslovakia, I was asked if I could take her out somewhere. It was summertime and I was working as a waitress to make money for school. The ‘in’ thing was to go to Old Town (I had never been there before so it was going to be a treat for me as well). Since we didn’t own a car, I had to beg one of my Slovak friends to talk one of her brothers into driving us. I don’t know how she did it, but she talked one of them into it. I was promised that I would be able to leave work early that day. Unfortunately, as it happens in the restaurant business, we were shorthanded and busy and I got stuck at work til almost 9pm. I ran home (a couple of miles) where everyone was waiting for me. Evidently, Stan and his wife had dropped Vera off between 6 - 7pm. They were supposed to drop her off at 8pm. I guess they thought if they dropped her off earlier, she would get home earlier, not taking into account that I and my friends had summer jobs to make money for college tuition. My mom had tried to explain to them that I was at work and so we would be getting a much later start. After I changed my clothes, Vera, Yvonne, Yvonne’s brother and one of my friends (who was interested in Yvonne) and I took off for Old Town. By the time we got there, it was almost 10pm. We had a nice time walking around and enjoying the late 1960’s atmosphere of Chicago’s Old Town. I am not sure when Vera was expected home, but we knew we were definitely late as it was after 11pm. Marian drove like a maniac down the Eisenhower Expressway to Elmhurst where the Mikita’s lived. During those days, traffic was very light at that time, not like nowadays, and it was clear sailing. We passed an accident on our way there but it in no way impeded us. I think Marian got us to Elmhurst in well under 20 minutes – don’t ask how fast he was going, no one will admit to it. As we pulled up, Stan and Jill were standing outside – not a good sign. Stan came toward me as I walked Vera to the door yelling at me for bringing his sister home so late. I tried to explain and even tried to blame the accident we had passed for us being late but he was having none of it. This is my ‘Stan Mikita claim to fame’ story and also the last time I actually saw Stan and his wife. When I got home, my mom said that Stan and Jill kept calling her wanting to know why we hadn’t brought Vera home yet. She tried to explain that the original plan was that we would leave the house around 8pm (the earliest I and our ‘chauffeur/chaperone’ could get there from work) but I had gotten stuck at the restaurant and we didn’t leave until after 9:30pm so they had to account for the late start. But Stan was in big brother protective mode. He and his wife were probably questioning whether they should have let his sister go with a couple of teenage girls and two twenty year old guys they didn’t really know to Old Town with its reputation for access to drugs. We were a pretty responsible group and not into drugs and Marian and Mike were given the task of keeping us girls safe. Except for the speeding (and that was only because we tried to mitigate the trouble we would be in by shortening the amount of time we were late), his sister was in the best and safest company. I hope that Vera has counted her excursion with us as one of her most memorable memories. My condolences to the Mikita and Gvot families..